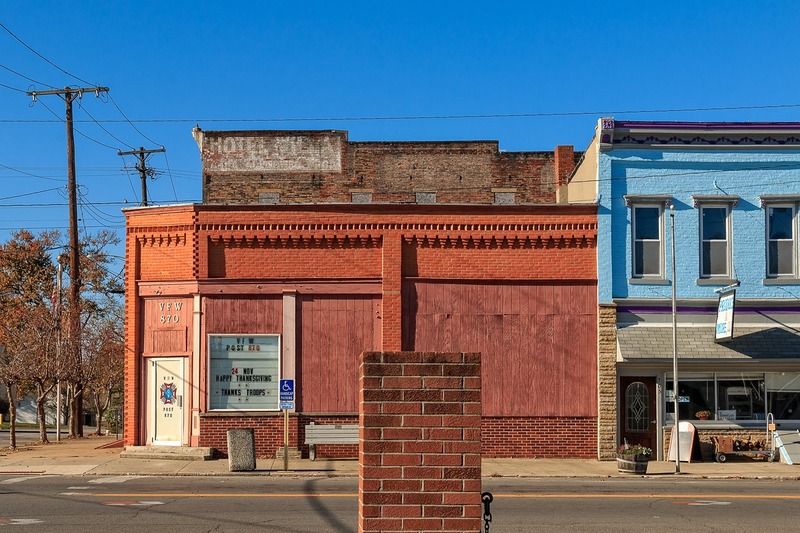 I periodically get into bursts of enthusiasm for my photographic excursions (I am in one now, as I write this) and November 2016 was one of those—I went on four different trips across Ohio that month and this blog post contains the first third of the second of those, just a few days after the presidential election. For this trip I drove a sort of curlicue north from Columbus into the wilds of middle Ohio. 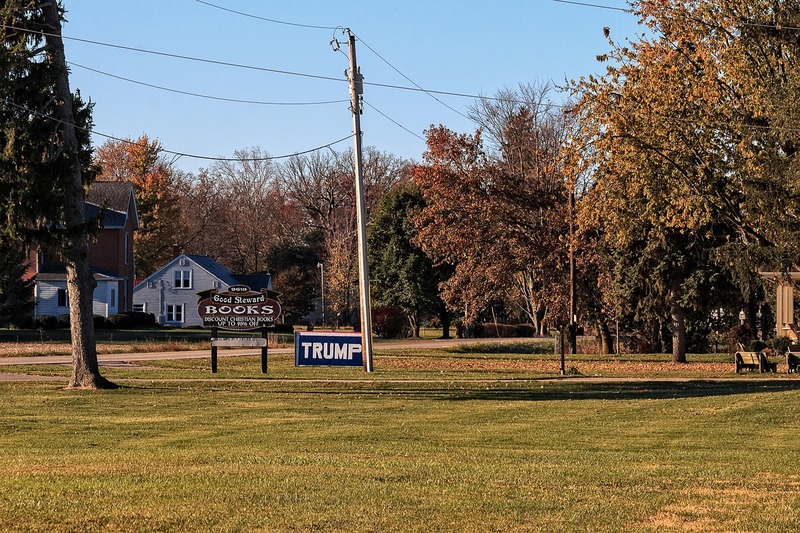 I started by heading west from Columbus before turning north and I didn’t get too far into the countryside before I saw a painful reminder of what had just transpired—a large handmade Trump sign erected at a country Christian bookshop. 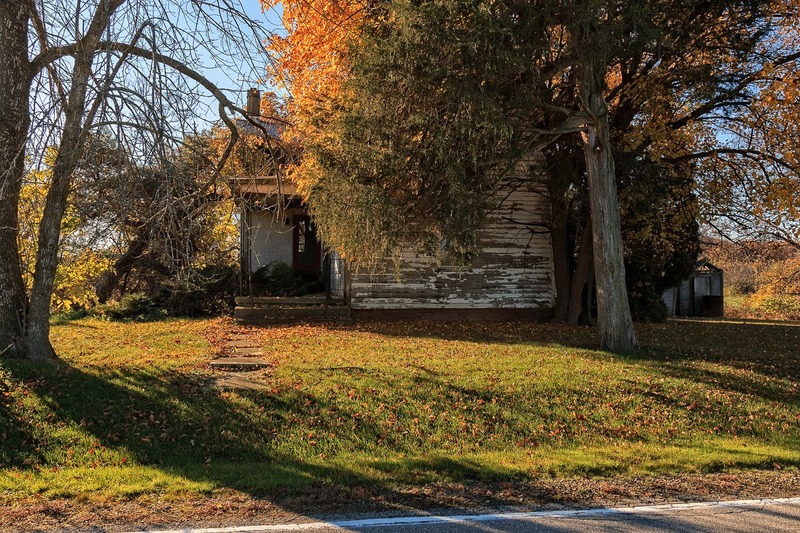 The previous month I made several trips into eastern Ohio and found tons of such homemade evidences of enthusiasm; it turns out that rural central Ohio was similar. Of course, when I made those trips, it was before the election and I believed all the polls that said Clinton would win, so the signs that I was seeing were more of an interesting anthropological curiosity to me, like coming across a bunch of Goldwater campaign buttons. Alas, the world turned out differently. Continuing out into the countryside, I eventually came across an attractive church, St. John’s Lutheran Church in Union County (there are several in Ohio; this is the one not far from Marysville). Next to the church was a cemetery and, on a whim, I decided to drive through it, just to see if I found anything interesting. 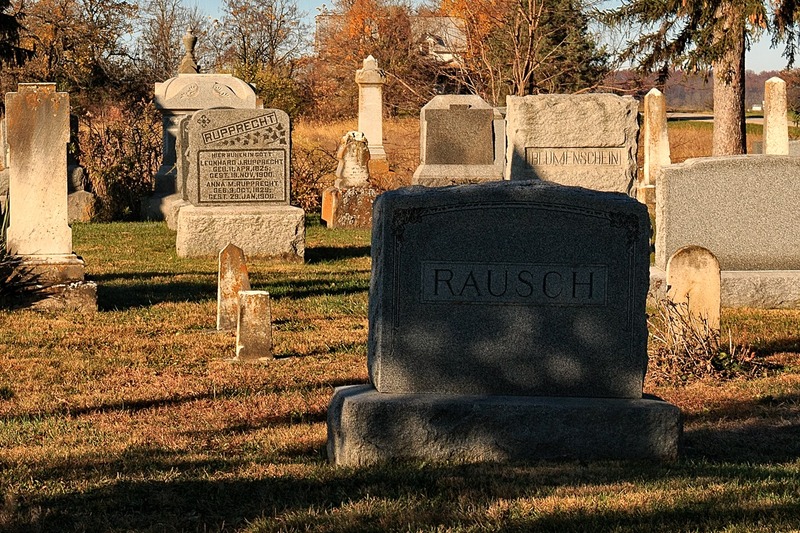 I had only been in the graveyard for a few seconds before I did find something rather fascinating: a rash of Rausches. 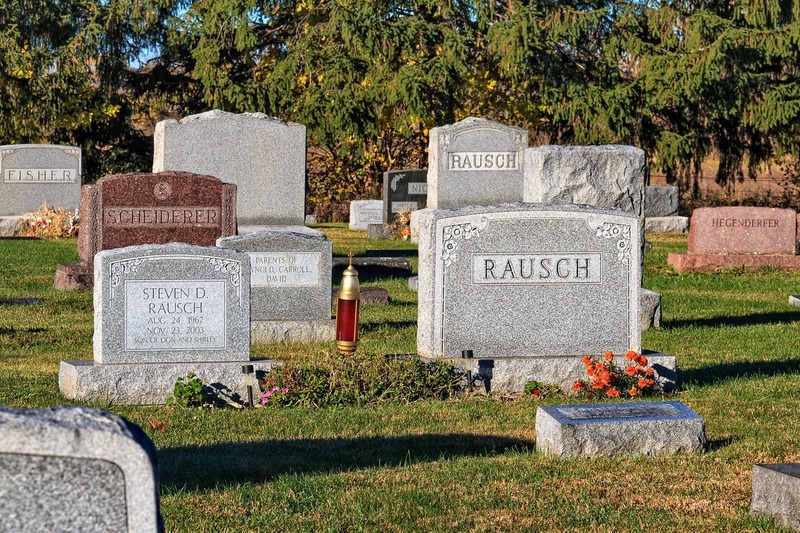 I kept coming across tombstones for people with the last name of Rausch. 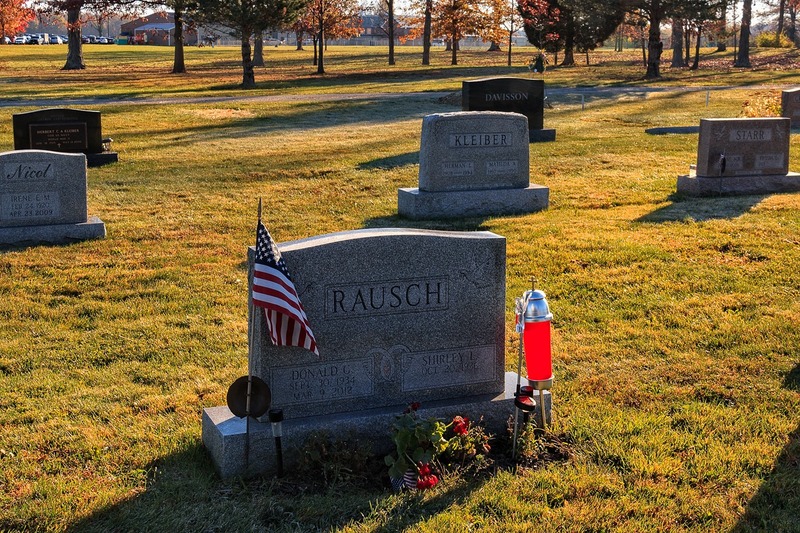 In this photo alone there are four Rausch headstones, with the headstone of LeRoy F. Rausch (1928-1992) and Mae C. Rausch (b. 1928 and apparently still alive at the time this photo was taken) front and center. 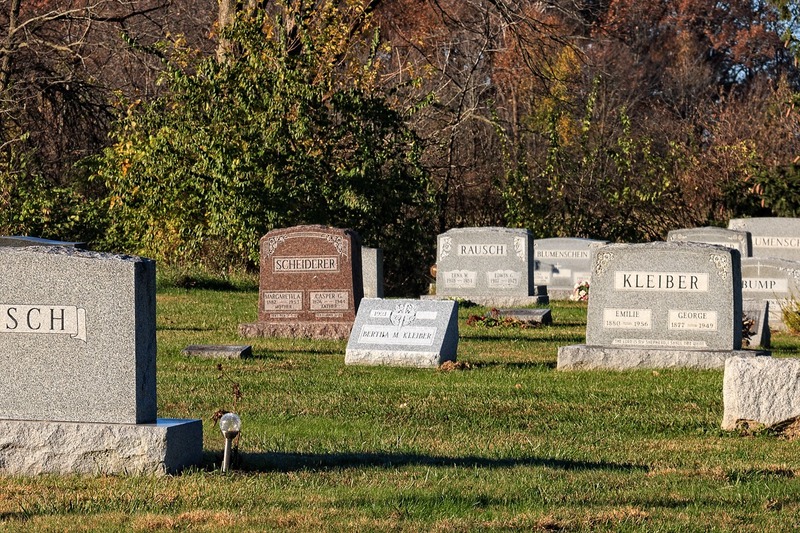 Here are yet more Rausches—some of the headstones have only the last name because we are looking at the reverse side of the memorials; the full data is on the other side. The most visible Rausch here is Steven D. Rausch (1967-2003), who died very young at age 36. The memorial gives his parents as Donald and Shirley Rausch. I was unable to find out how Steven passed away, but his father died in 2012 “surrounded by his family.” I would like to think the same of Steven, but with such an early death, I fear that may not have been the case. Two more Rausch stones here, including that of Edwin and Erma Rausch. 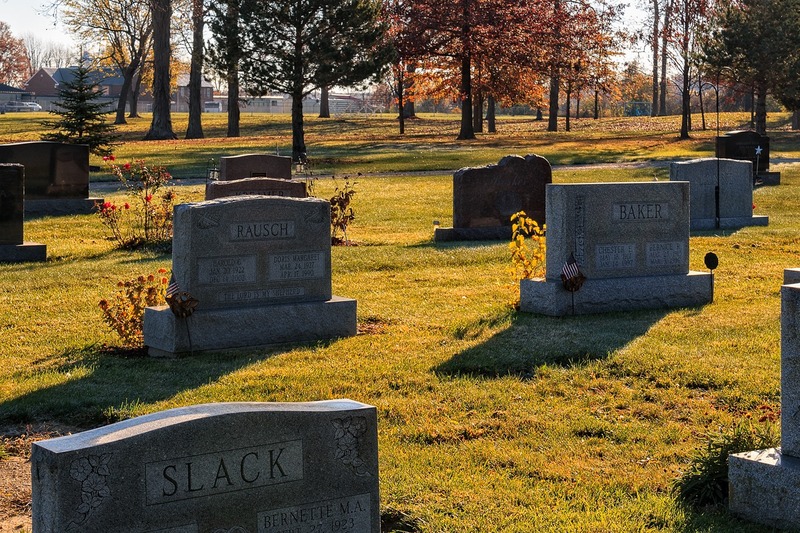 If you hadn’t already noticed it, there are multiple family names well represented in this cemetery—Scheiderer, Kleiber and Blumenschein are also seen in multiples here—and that the well-represented names are all German in origin. The reason for all of the Germanic names is because this little spot of Ohio was settled by German immigrants. Indeed, a particular group of German immigrants. The original Rausch family (I believe Johann George Rausch, 1803-1859, and his wife Anna Rausch, 1804-1888) and a number of the other pioneer German Lutheran families of this area, left Neuendettelsau in Bavaria for America in 1831. The westward trans-Atlantic crossing would normally have taken about eight weeks but their ship was severely damaged in rough Atlantic weather, resulting in a harrowing voyage of nearly 100 days before they arrived in the Chesapeake Bay. One son was born to the Rausches on the trip but the infant lived only a day. In some ways, the Rausches were lucky; a number of other pioneer families sailed on the James Beacham Galt, which—severely damaged by what was probably the same storm–shipwrecked on the Virginia coast. Many of the pioneer families stayed in the Baltimore area for a year or two, but made their way west to Ohio, presumably on the good word of the first few who found it. 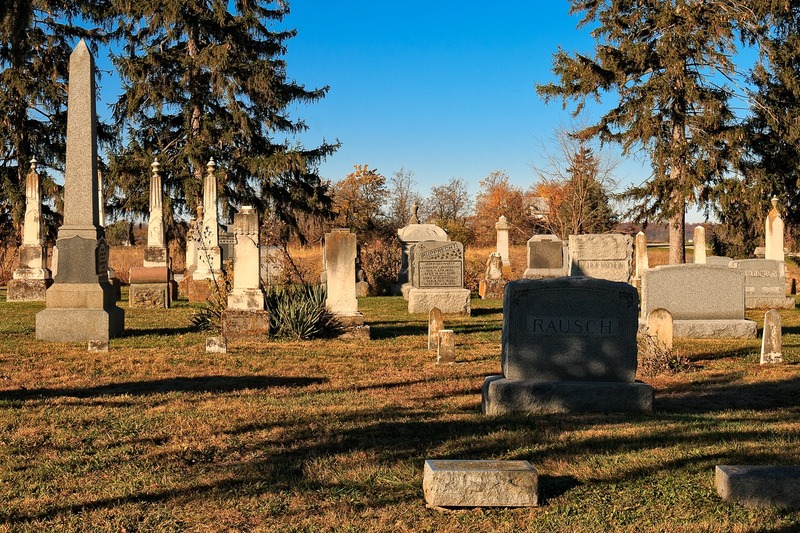 While a Rausch lies buried in the foreground of this photo (an enlargement of the previous photo), further back is a grave marker for two of the first settlers: Leonhard J. Rupprecht (1825-1900) and Anna M. Rupprecht (1829-1906), who were probably born in Germany and taken over as very young children. Assimilation for the Rausches must have proceeded pretty quickly, as German first names did not last very long. Here we see a headstone for Harold C. Rausch (1922-2002) and Doris Margaret Rausch (1927-1990). 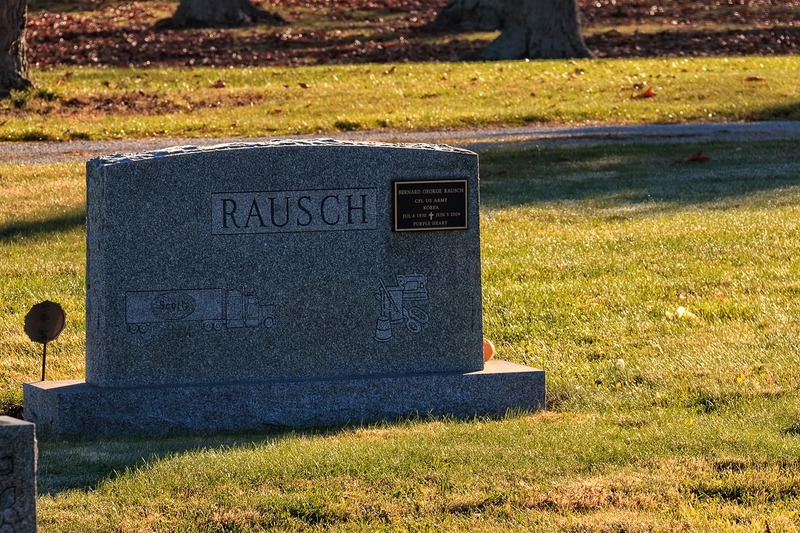 Here lies Donald G. Rausch (1934-2012); his wife Shirley (b. 1936) will one day join him, it seems. Veteran’s Day had just passed when I went on my excursion. Many Rausches were veterans of war, including this Rausch, Bernhard George Rausch (1930-2009), who fought in the Korean War, where he received a Purple Heart. Notice that this headstone contains the image of an 18-wheeler with the word “Scott’s” on it. That is because The Scotts Company, also known as The Scotts Miracle-Gro Company, a major producer of fertilizer and lawn care products, is headquartered in nearby Marysville, Ohio, and presumably Bernhard Rausch worked for them (alongside, in all likelihood, other Rausches). What I have relayed tells one familiar story of the making of America: the economic immigrant family, seeking opportunity, travelling to the United States and creating generation after generation of descendants. 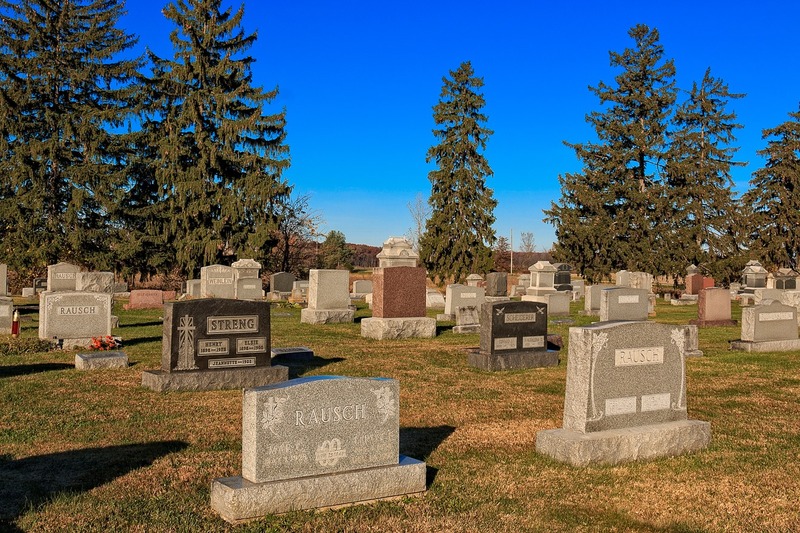 Two hundred years from now someone will be looking at headstones with Somali names, descendants of immigrants who did the same thing this past generation. Eventually, I ran out of Rausches and decided to continue on my journey. I began to head north and east, skirting Marysville (no offense, Marysville, you are awesome). Here is a small abandoned farmhouse I saw along the way. 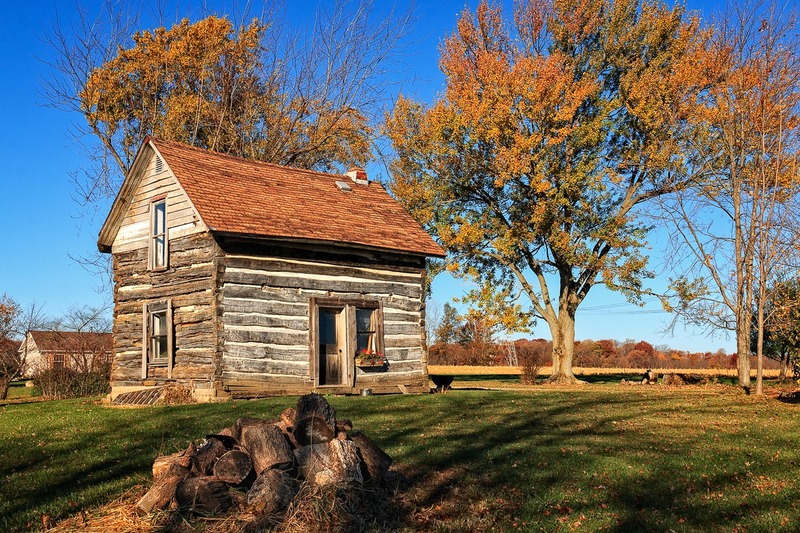 Of course, if one wants small, this tiny cabin does the trick even better. I found it a tad east of Marysville. I am very curious about it; it looks fairly old, but is also quite well-maintained. Between Marysville and Delaware, but a bit to the north, is the hamlet of Magnetic Springs (population 268, salute!). There are (or were) underground springs in Magnetic Springs, but I regret to inform that magnetism is pretty thin on the ground in this tiny cluster of homes. The resort hotels it once sported—so that people (particularly polio sufferers) could “heal” in the springs—are long gone, as is about a third of its population. However, Hiney’s Saloon has survived. One does not often find bar/dairy bar combinations, I will grant them that. For half a century, the owner of Hiney’s Saloon was Jeannette Jones (are you as sad as I was at the lack of a Hiney? ), but she died in January 2017, two months after I took this photo, which makes me curious about its future (although she left 27 great grandchildren behind, so there is not exactly a shortage of relatives to take over, if one of them has a will to do so). 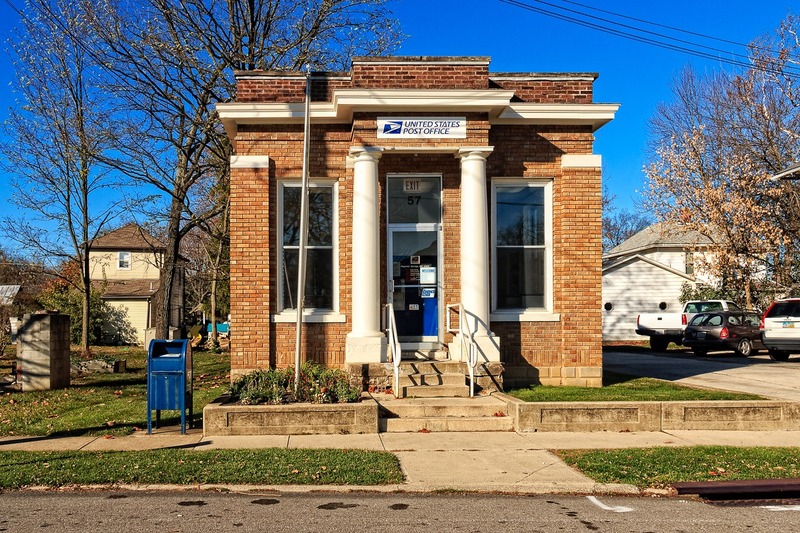 One of the few other remaining offerings that Magnetic Springs has is its post office, which has to be one of the most fascinating post offices I’ve ever seen—and surely the smallest post office ever to have columns. In 2011, this post office was reviewed for possible closure, but managed to survive. I wonder if it will able to survive for any appreciable time to come. I hope so. 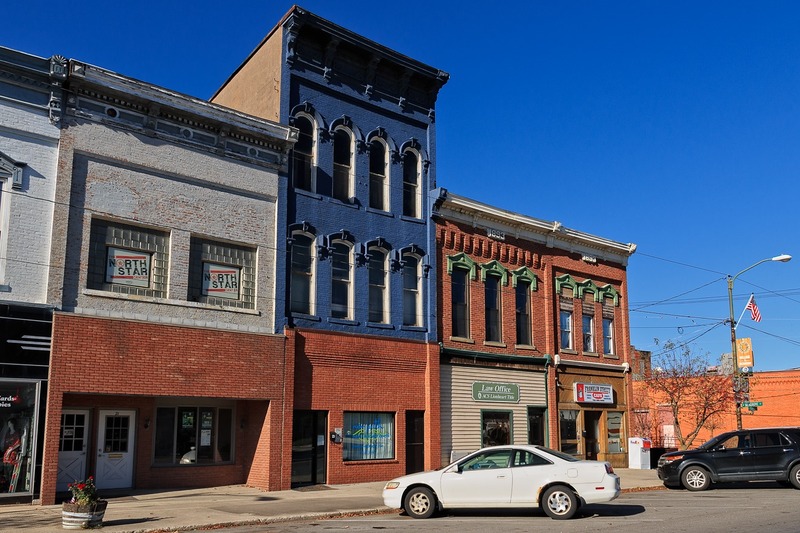 North of Magnetic Springs, about the distance of a good spit, is Richwood, Ohio, pictured above. Compared to Magnetic Springs, Richwood (population 2,229, salute!) is practically a metropolis. However, its post office has no columns. Richwood is big enough to have a Subway, which is the fast food franchise that seems to have the lowest population bar threshold. 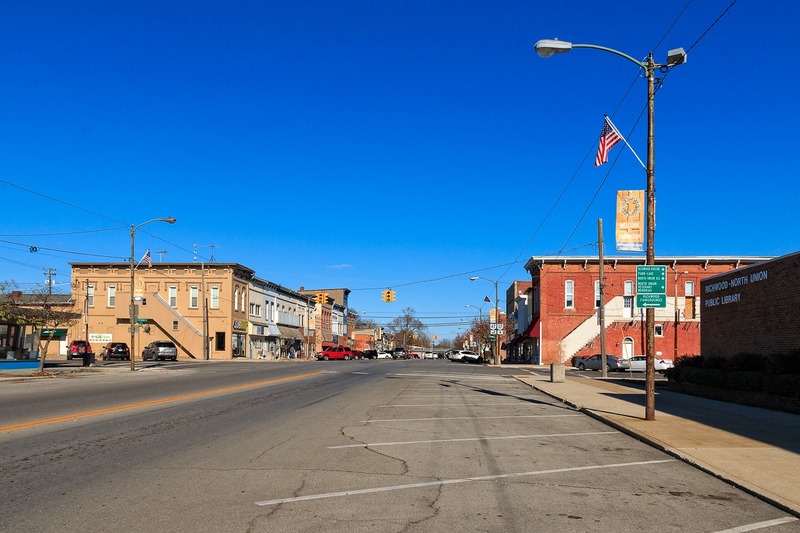 Though it looks fairly wide open and empty here, Richwood has not suffered the population losses of many other Ohio towns—though western and middle Ohio are far less susceptible to such population loss than other areas of the state. 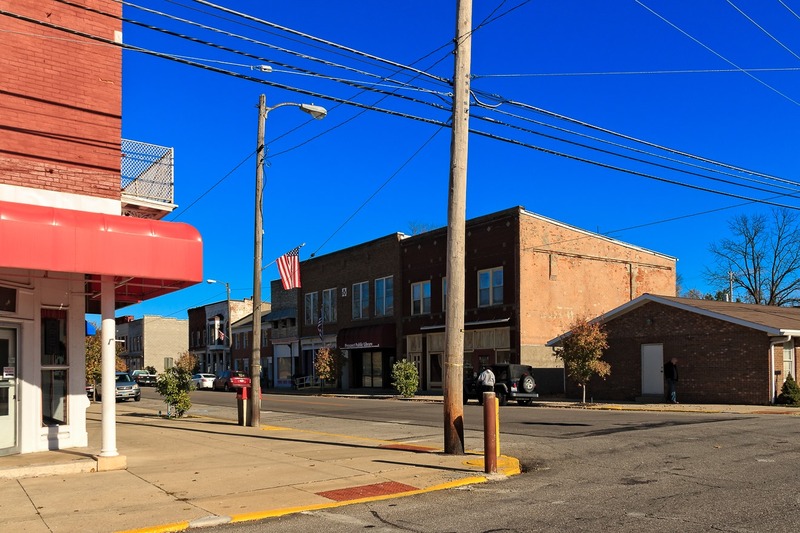 Richwood even has businesses (on the ground floor, at least) of its old business district, which are in short supply in many small towns and villages, victims to regional shopping centers, places like Wal-Mart, and, more recently, the Interwebs. 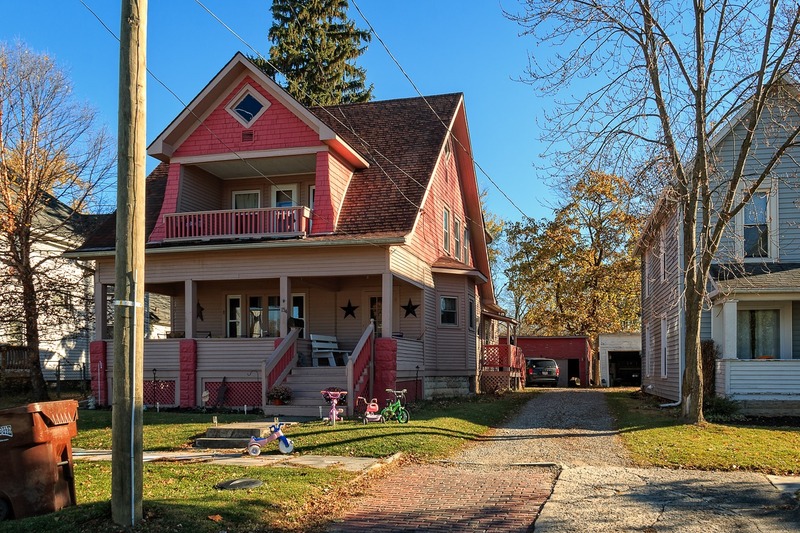 Richwood is also home to this very pink house, which I display here despite the amateurishness of this photo—somehow I was too blind to see the telephone pole blocking complete view of the house, whereas I could easily have pulled my vehicle forward a few feet to take the photo. But, anyway, pink house! Here is Richwood’s VFW hall, which clearly was once something quite different, something that did not require boarded-up windows. When I saw this scene, though, what caught my eye was actually the building peeking over the rooftop of the VFW, with its fading sign reading “Hotel.” After staring at it for about an eternity through my telephoto lens, I finally decided that it read “Hotel Villa.” I couldn’t make out the lettering beneath it. That, I thought, was worth a closer look, so I decided to drive around and approach it from the other side, where I noticed that all my sign-scrutinizing had been something of a waste of time, because there was also a sign hanging from the front of the building which read Villa Hotel. 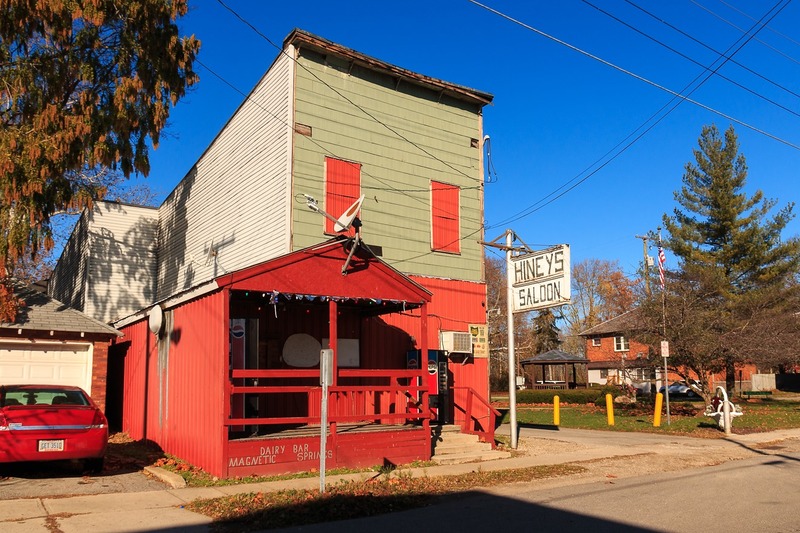 Today, the Villa Hotel is nothing more than a small town bar and grill, but once upon a time this place was grander—and an actual hotel. 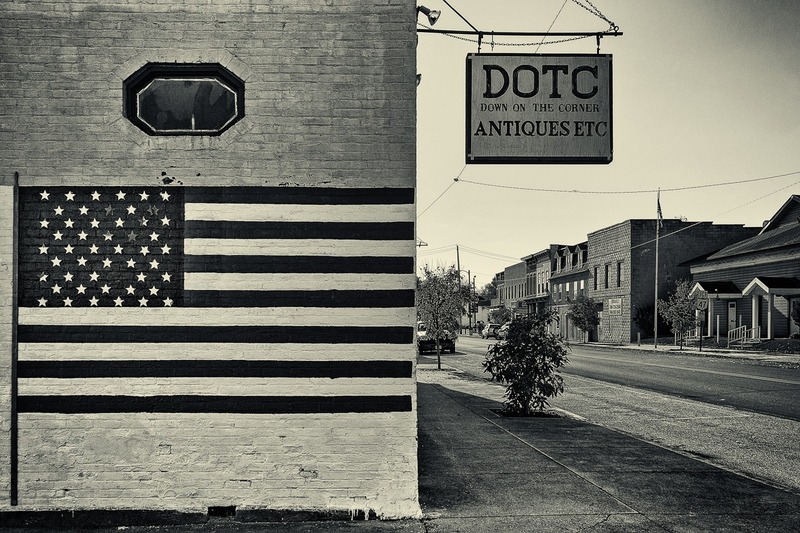 In 1915, it hosted a banquet for 50 members of the Richwood Commercial Club. The Villa Hotel was listed in the 1920 Official Hotel Red Book and Directory with C. Allguwer as proprietor (rooms were $2.25 to $2.50 a night) and in the 1922 Hotel Monthly magazine, with J. M. Evans was its proprietor. One past owner, Elma Agnes Tanner, died in 1997 at the age of 90. More recently, the Villa Hotel had been owned by Kathy Gray and partner (in both senses of the word) James Dillion, but Gray died in January 2017 and Dillion passed away in April 2017. Essentially, between the time I took this excursion and the time I posted this blog, everybody in Ohio has died. 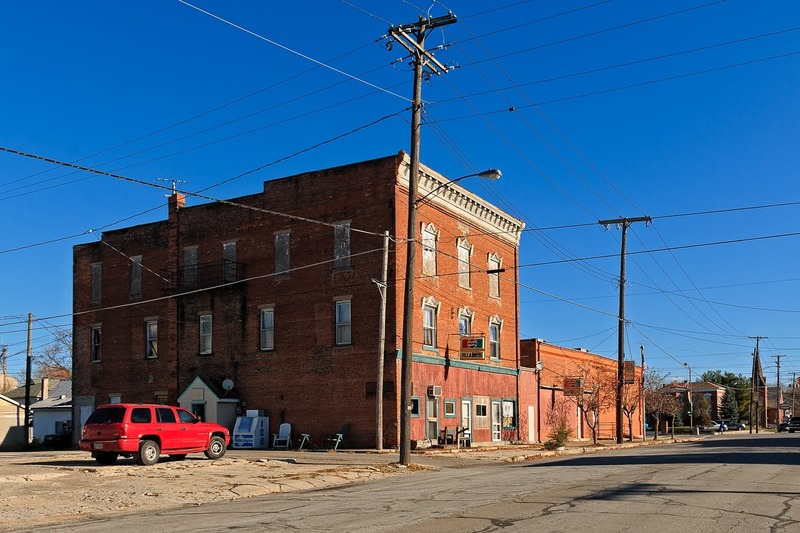 Perhaps three miles east of Richwood is Prospect, Ohio (population 1,112, salute! ), a placid little village whose population hasn’t changed much in the past century. Even Wikipedia can’t be bothered to say much of anything about Prospect, so I dug up this historical nugget. Very close to Prospect was where the Greenville Treaty was signed in 1795 to end a short but brutal Indian war, with General “Mad” Anthony Wayne signing for the U.S. This treaty created the Greenville Treaty Boundary Line, north of which was “given to the Indians” and the land south of it “to the White Settlers.” We know how that worked out. Here’s a shot of Prospect’s main drag looking from the other direction. 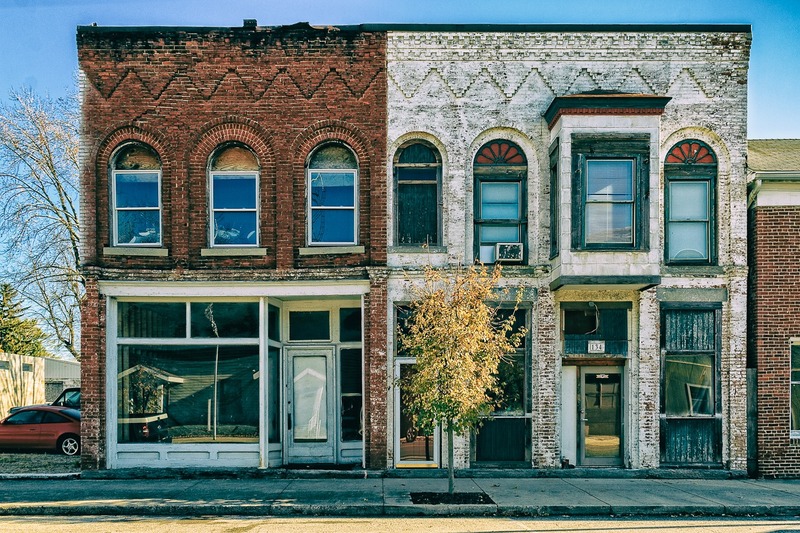 Empty storefronts are far more typical in village and small town Ohio than are places open for business, a lingering reminder of a very different American economy. Inevitably, this building too will be gone. But I’m happy to say that 1) there still are businesses operating in Prospect, as this sign suggests, and 2) that building-side signs still exist and are not, like the Hotel Villa sign, merely a thing of the past. 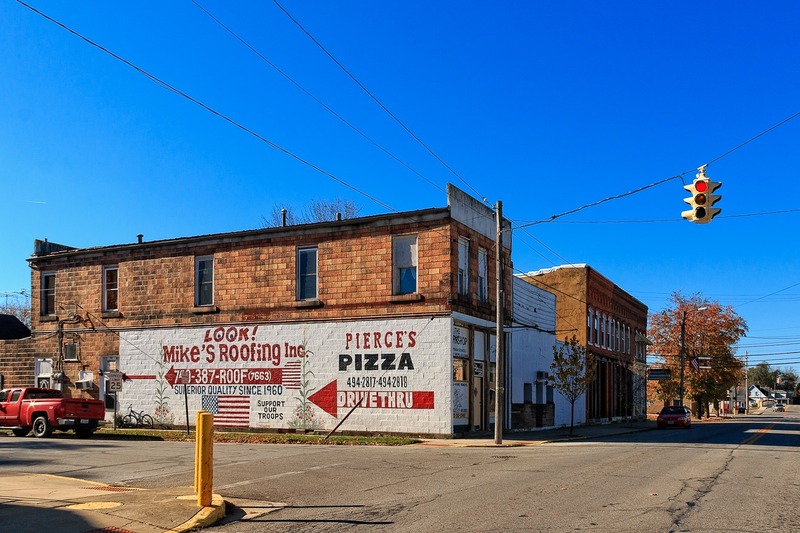 If you ever drive though Prospect, please grab a pie at Pierce’s Pizza and a roof at Mike’s Roofing (which, oddly enough, is owned by a guy named Martin). One final shot of Prospect—and the final shot for this blog entry. 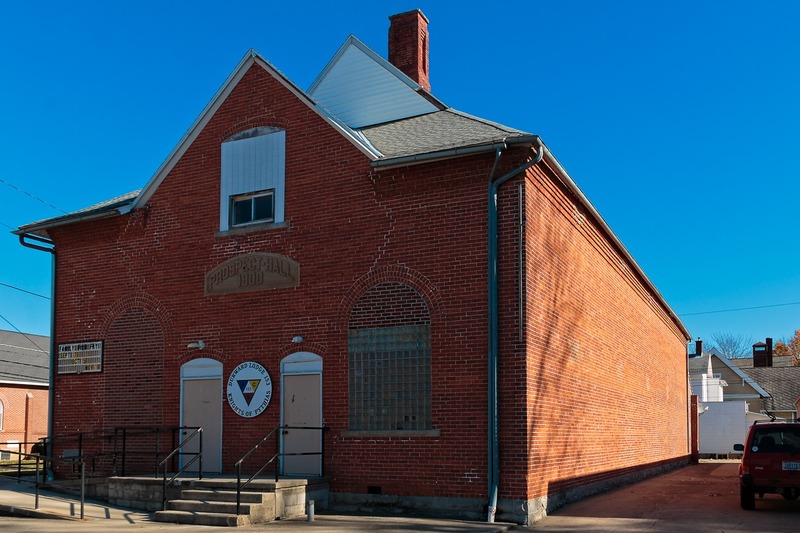 Here we see the former Prospect Town Hall, complete with two doors (that’s how bustling this crazy place was), which is now the lodge for a fraternal organization, the Knights of Pythias. The Knights of Pythias are not a very well-known fraternal organization, but they were founded in Washington, D.C., in 1864. Oddly enough, “maimed individuals” were not accepted until 1875, which must have been irritating for Civil War veterans who wished to join. Three U.S. presidents, two vice-presidents and two Supreme Court justices have been Knights of Pythias.